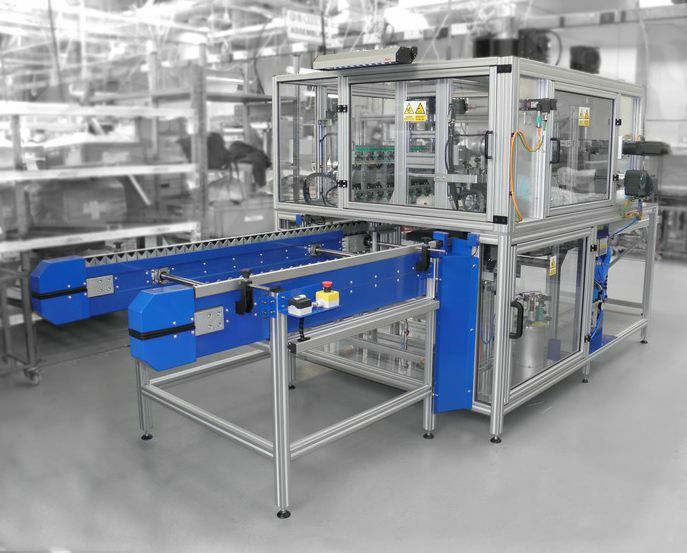 The machine is intended for applying liquid rubber to the surface of aluminum pipes in automotive conditioning units. The machine is adapted for handling pipes in a diameter of 8.5 and 18 mm. The length of machined pipes is 150 up to 900 mm. The accuracy of the deposited layer is ± 1 mm. Machine cycle is set to 6 seconds. The machine operator puts respective pipes into the machine using the input unit (conveyor) equipped with insertion beds. The entire cycle of handling, clamping, depositing and drying is automated and after completing the respective operations, the pipe comes out from the machine on a controlled conveyor belt where the operator takes it away.